Marina Garden offer rooms for every budget: deluxe rooms for those who can’t live without aircon or hot showers, connecting rooms for families and barkadas who can’t fit in one room, huts made of nipa for those who prefer the rustic setting and townside rooms for those who prefer a more contemporary accommodation without breaking the bank. On the beach, Marina has four (evil) lounge chairs for their guest’s use, and several more inside the fenced area (still fronting the beach). There are also hammocks if you want to really relax under the shade of the coconut trees. Marina has a quaint cafe in the beach that serves breakfast, lunch and dinner. Meals at their restaurant aren’t cheap, but they’re not too expensive either. Breakfast sets usually go for Php 120, while lunch and dinner meals start at Php 140. Do order the salt and pepper squid. It’s goooood. Aside from the perfect beachfront, Marina is also strategically located in the center of town. El Nido town is small to begin with, but you don’t have to walk far from Marina for cheap meals, souvenir shops, sari-sari stores, pharmacy, tourism office, and a Catholic church. Gail, Marc and I booked Room number 1, their deluxe room. 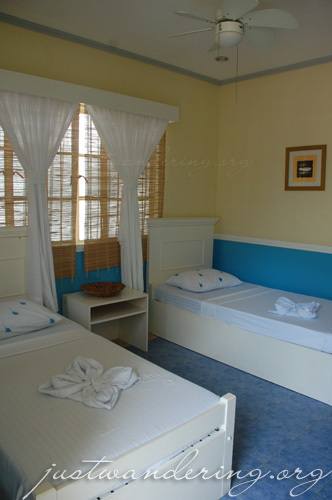 The room comes with hot and cold shower, cable tv, aircon, and a space in their veranda. The room comes with 2 single beds, and just have enough room for one extra matress (on the floor). The beds are comfortable and comes with one fluffy pillow each. There’s also a closet (with hangers and a couple of drawers) for your clothes, and a dresser for your toiletries. 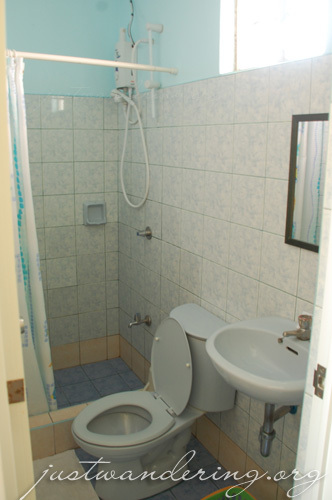 The ensuite toilet and bath is also rather small, but it’s a comfortable enough fit for one. At least my knees aren’t touching the wall when I sit in the toilet. Water pressure is pretty weak, but the toilet flushes without a hitch, so it’s all good. One tiny problem is that the bathroom window doesn’t open properly, so there’s no proper ventilation inside the toilet. Marina Garden Beach Resort is a Wi-fi zone. There’s wireless internet in almost all parts of the resort. We can surf the internet from the comfort of our beds, or out on the beach, facing the beautiful blue waters of El Nido bay. Okay, now I remember why I booked with Marina. All in all, I am quite satisfied with my stay here. Php 3,426 for 4 nights, 4 breakfasts, countless hours spent relaxing on their (evil) lounge chairs, and one spectacular view. I’d say it’s a great value. 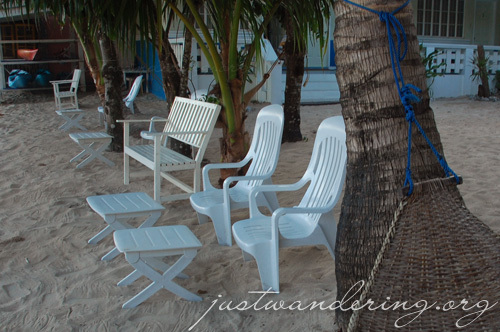 If and when I go back to El Nido, I’m definitely staying at Marina Garden Beach Resort again. hi nina, thanks for the great review. this is where we’ll be staying, too. good to know that the beach is clean and ok for swimming. and that P200 environmental fee covers all the islands, though i read somewhere that they were charged an extra fee to stay till sunset at 7 commandos island…is it fair to ask which you liked better, el nido or coron? Wow, the place is truly perfect for keeping yourself away from the bustling city. I wish I could go and pamper myself with all the facilities available. Nina, I guess I need your help for this. Hope you can help me out in reaching to that paradise. You always do a fabulous job in describing where you stay, and I was wondering are most of these hotels kid-friendly? I’m just wondering, since I’ve got a little kiddo in tow, and it’d be great to know if they accommodate families with children. Also, the prices are CHEAP. Aaaaargh, how I wish I was there right now! Cat: I think Marina is kid-friendly. I’m betting Rome would love the hammocks! Sweet! Kid-friendly hotels is a plus! Dunno if Rome would be able to sit still in the hammock—he’ll probably end up getting tangled in it! mgkano po ba ang room rates d2? and also, thank you so much for your v. helpful and informative blog! I like Palawan because it is clean and green. My family visited PPC and toured Dos Palmas last month. Hope to be back for El Nido next time. Thanks to your blog. I have read lots of infos regarding Palawan. 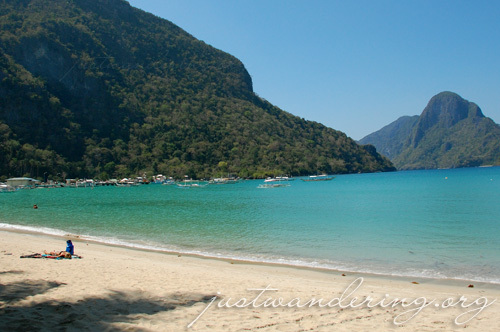 Thank so much for your posts on El Nido. It was most helpful. Not to mention that it would save me hard-earned money that would have been spent on the so unreasonably expensive lagen or miniloc resort. Keep it up !!! Hi Nina! Thanks for the info on Marina El Nido, i recommended it to my friends on our blog. I’m sure they’d find it helpful as well. Hi question Ms. Nina would you recommend casa el nido if you’re a group or Marina Garden is still a better choice? Thanks! If you’re a really big group, Casa El Nido would be a better choice since you can have the entire house to yourself. Marina’s room number 1 can only comfortably fit 2-4 people. Thanks for the review! 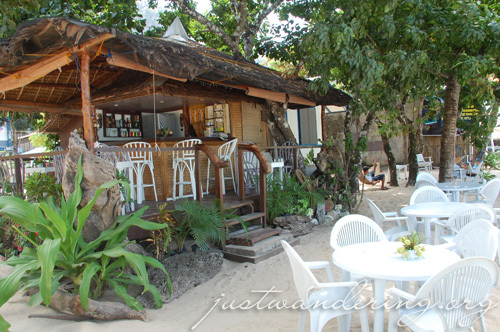 I’m planning a trip to El Nido this summer and was looking for places to stay that won’t burn a hole in my pocket. I was wondering if you flew to El Nido or did you have to catch a van from Puerto Princessa? Hi Grace, we flew to El Nido. thanks a lot for this! i’ll be going to el nido next month and we’ll be staying at marina too. hello Nina thanks for all the informations. We are flying to the Phil. next week and El Nido is one of the places we want to visit.have any idea about te rate of tricycle ride in El Nido. Regards and Have a Blessed Year! The town is small enough that you can easily walk around without having to ride a tricycle. If you’re going to outside the town proper, rates should be around Php 50-200, depending on the distance and your bargaining skills. Hi. Did you get the air conditioned room or not? Cause for 4 nights, that’s pretty cheap and I was looking through their website and it said theyre asking 2100 for ACed rooms. Hi Paula, yup, we had the air conditioned room. We stayed there way back in 2010, they probably had a rate change since. Hi ate,this blog is really helpful. It is been long time that I wanted to visit the place but I was wondering about the accommodation. Thnk you for taking your time to make this wonderful and helpful blog. How many hour will it take us from Puerto Princesa airport to El Nido. We r planning to go there on October for 4 days only. I am not sure whether this time is enough for us to enjoy the whole places of the island.Can’t wait to be there. Thank you before for the answer. Hi Chris, the ride from Puerto Princessa to El Nido town takes about 5 hours. You’d need at least one full day for island hopping in El Nido. It would depend on what time your flights are. If you’re arriving in PPS early morning, you’ll be in El Nido in the afternoon. Thank you so much for this. So helpful! Hi Ms. Nina I truly appreciate this post. This is very helpful for folks who have not yet been to Palawan and are clueless on where to stay. Question though, did you made early reservation to the resort and if yes how did you go about the payment? Were planning to go there by December. Hi there and great review of this resort! I was curious if you have info on Casa El Nido (as mentioned above)… is it thru Marina Garden Beachfront Inn too or separate? Didn’t see it on their website. We are a group of 5 friends visiting El Nido next month and having a hard time finding a good place. thank you for the tips. Wondering if you have any special recommendation accomodationwise or tourwise for a couple travelling with a baby? Did u fly from manila to el nido directly? or manila to puerto prinsesa? Lastly do u have any tips for puerto prinsesa as well? Hi Dinz, this article is 5 years old, and there are probably many changes in El Nido since. There are definitely more accommodations available now than before, but the electricity situation remains the same. Seair does not fly direct to El Nido anymore; the only airline that do is ITI. It’s pricier than if you’re flying via Puerto Princessa, but it’s definitely more comfortable, especially if you are traveling with a baby. If you fly via Puerto Princessa, you would need to ride either a bus or a shared van (unless you commission a van for your family only). That will take about 5 hours, with portions of the road in very bad condition (though I’m not sure if they have fixed that already). Tour-wise, I think it’d be better if you get a private tour, instead of joining a group tour. That way you can pick the places you want to visit, and not worry about other guests if you want to stay longer in one place. You can contact Aleo Olmedo at aleo_olmedo@yahoo.com. He was our tour guide when we went in 2012. He can arrange the tours for you, including the van to take you from Puerto Princessa to El Nido (if you’re going that route). Ironwulf.net has several El Nido properties reviewed, and they are fairly recent, so you might want to check them out too. I haven’t really explored Puerto Princessa, so I can’t really give much advice about it. Do try Ka Lui for lunch or dinner, and talk with your hotel about tours to the Underground River (if you’re doing that), because I hear the queue for that is pretty long.